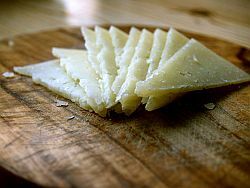 Now I don't know about you, but I always thought Manchego cheese was goat's milk cheese, but, in actual fact, it's made from the milk of the Manchega sheep. 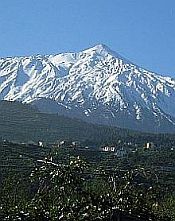 This cheese, found all over Tenerife, is protected by a so-called Denominación de Origén. This ensures that it is the genuine article and is made only from the milk of the Manchega sheep and has been matured for at least two months. 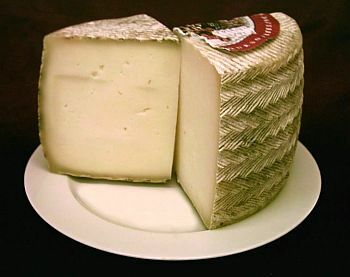 It is the length of the aging period that determines the cheese's potency - it can be mild to strong. The Manchega sheep comes from the region of Castillo La Mancha, a large area south of Madrid. The cheese is produced in the shape of a barrel (although you can buy smaller, wedge-shaped portions). Covered in an inedible rind with a "tyre tread" marking on it, the cheese inside is of a creamy texture, not too overpowering and slightly salty. Its colour is golden and it is dotted with small holes. Tenerife tapas bars routinely stock this cheese and the waiter will gladly cut you a few slices. It is best enjoyed along with something else, such as Serrano ham.